6 New Painting Lessons! 3 Technique Lessons! Join David as he shows a new way to paint scrolls and roses. Learn composition, acrylic technique and decorating skills. Learn to use new colors in new ways to create beautiful decorator looks that will work in contemporary homes. These attractive designs are elegant yet maintain the roots of tradition. David uses some of his new shear techniques to create the look of oils but with wonderful acrylics. Paint 6 beautiful pieces with limited brushes and colors. Learn design, placement and flow with simple technical lessons that will improve are painting skills. There is a new direction coming in the arts. Time for a change. Experience beautiful casual scrolls and the elegance they bring to any design. Learn simple and casual ways to paint them and add them to any of your designs. Learn how to incorporate roses and blossoms with those scrolls to enhance the elegance. 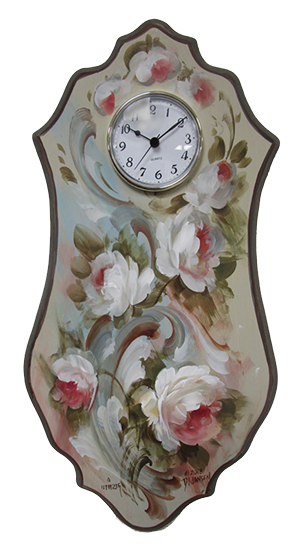 Click the button below to add the B5048 Roses and Scrolls Download to your wish list.